You own your own data. You can install searchcode server in minutes. No external products or tools are required beyond the Java Runtime Environment. Runs on Windows, Linux, OSX, BSD or anywhere else Java runs. Even better, it maintains itself. 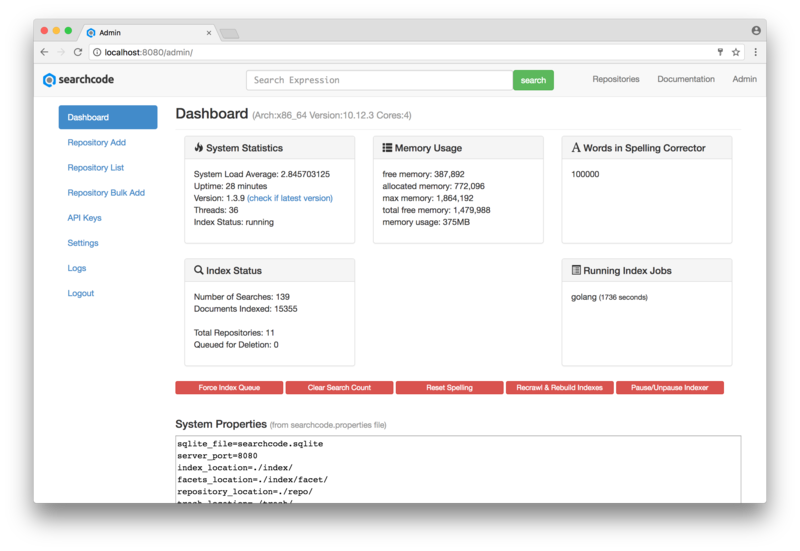 Beyond the inital install and adding of repositories to index almost no maintenance is required. After all, you and your team have better things to do. 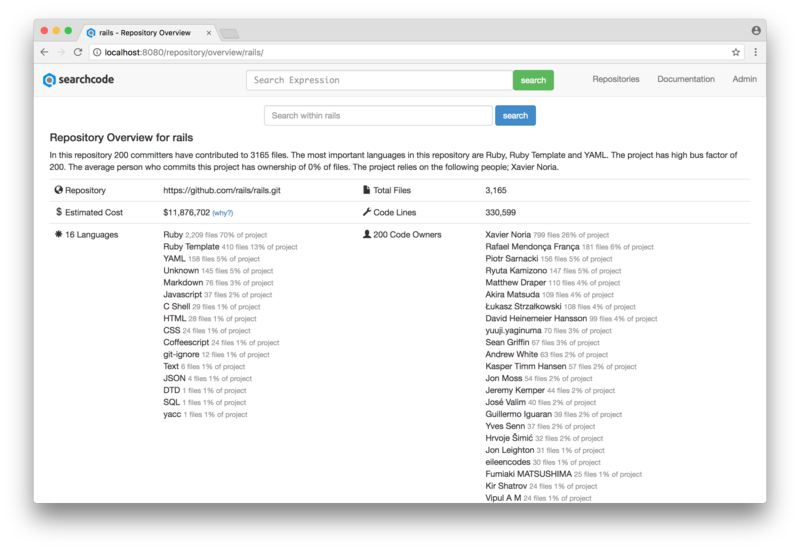 Add a GIT or SVN repository through the UI. If you have another SCM you can add it as a file repository. Configure the username and password (if required) and click add. The repository will be instantly added to the queue for processing and you will be able to find its results in a few minutes. Recognises 100+ languages out of the box and can be configured to recognise many more. Search also supports special characters. The following + i++; and + are not only a valid searches in searchcode but likely to return results for most code bases. Don't want to use the UI? No problem. You can administer most functions of searchcode server through the secure API. Generate your API keys and start implementing. Example code exists to call the API in both Python and Java. 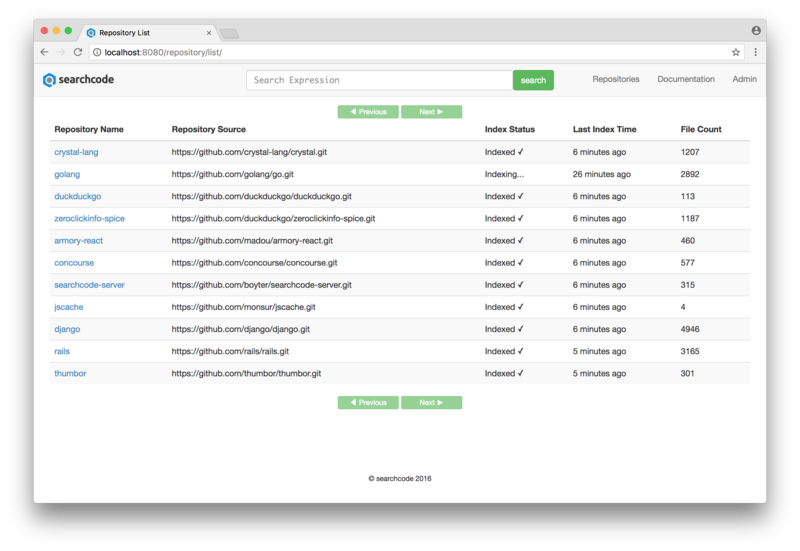 Get an overview of any repository indexed with a single click. Find the number of active contributors, the estimated repository cost, what languages are used and the key people. Check the current status of indexing via the repository overview page, or login to admin and get server details. Logs are also available without needing the command line.